Offsite work can be undertaken by CSC Services to enable every day business operations to continue. Structures, pipes or equipment can be brought to CSC Services’ specialist premises for repair, preparation or coating work. Offsite work is useful when the structure to be repaired, cleaned or coated is situated in a sensitive area such as a power station. By taking structures offsite for cleaning or refurbishment work, day to day operations can continue. Structures, pipes or equipment of up to 3m wide can be forklifted in and out of CSC Services’ specialist unit in the North East. CSC Services’ operatives have received specialist training in a range of related areas including abrasive blasting, ultra high pressure water jetting and airless spray painting. Regular CPD training is also carried out with the the product manufacturers of coatings installed by CSC Services. CSC Services are also an approved installer of Polyurea. This superior coating can be used for waterproofing and corrosion protection and can also be installed at the CSC Services Specialist Unit. CSC Services operate nationwide. Please call us on 0191 410 3444 to discuss your requirements. CSC Services recently completed a job for client EDF Energy to repair and coat Ferrous Sulphate Tank Lids. 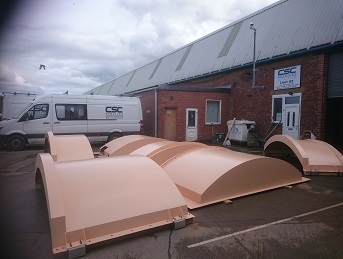 The tank lids were transported from Hartlepool Power Station to the CSC Services work unit for the refurbishment work as part of a plant upgrade. Abrasive blasting equipment was used to remove failed coatings. A new marine grade GRP coating was applied to protect against salt and chloride attack. This consisted of a primer undercoat and top-coat. Two clear protection coats were applied before waxing and polishing to complete the job. The tank lids were then transported back to Hartlepool Power Station and secured back into position.